Hugo Boss fragrances epitomise the essence of luxury, youthfulness and unconventionality that is so integral to the Hugo Boss fashion line. The brand is split between two universes: the irreverent and upbeat Hugo, and the slick and sophisticated Boss. With over 25 fragrances between them, there’s a wealth of choice with today’s flash event! Choose from best-selling fragrances like Hugo Deep Red and Boss In Motion, or perhaps the newer Boss Orange for Him and Boss Orange for Her are more to your taste. There’s a signature scent potential in each and every juice, so whatever choice you make you’re sure to make someone very happy this Christmas. Discover the entire Hugo Boss fragrance range right here at Escentual. 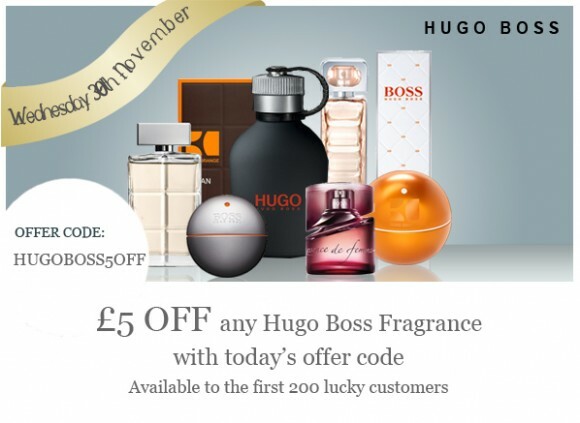 Simply add your chosen scent to the basket, and use the voucher code HUGOBOSS5OFF to get your £5 discount. This entry was posted on Wednesday, November 30th, 2011 at 8:00 am and is filed under Christmas, Gifts. You can follow any responses to this entry through the RSS 2.0 feed. You can skip to the end and leave a response. Pinging is currently not allowed.